In my last blog I focused on the emotional challenges that arise in the earlier stages of Alzheimer’s. But as we know, in Alzheimer’s things don’t remain the same for long – things change. As the disease progresses, stage 5 onwards, the emotional challenges are different. The battle is over – people with Alzheimer’s have lost control of their lives and they enter a new phase. Often by this stage they are a resident in a care home. Now, periodically memories of things long forgotten that are buried deep in the unconscious come to the surface. Carl Jung referred to this as, “the personal unconscious in which forgotten or repressed material surfaces in a state of diminished consciousness”. This dissolution process is also known to happen at the end of life generally and it seems Alzheimer’s is a protracted end-of-life experience. It would be easy to ignore and dismiss such troubled thoughts when they arise, and try and protect the person from them. But I believe this is not best way forward and that this situation actually provides an opportunity for deep healing. My mother said, “I am a bad person”. She would never have made a self-critical statement like that before she had Alzheimer’s. I could have tried to protect her by brushing it off and moving on quickly, but I wanted to know what she was thinking that had given rise to this statement. She also said, “I always did my best”, showing an awareness about her circumstances. Knowing her personal history I gently opened up the way to talk about difficulties she had experienced in her life. She was eager to do this and welcomed me talking about her life with her. Her eyes were bright and focused and she nodded frequently, affirming what I was saying and contributed from time to time. I acknowledged that at all times she had indeed done the best she could. This process of reviewing the difficulties she had experienced helped to clear the emotions that had surfaced and enabled her to move on. Episodes like this continued to occur from time to time, and each time we addressed them with understanding and cleared them. 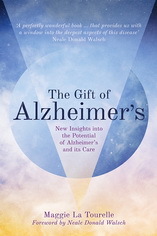 It seems that this later stage of Alzheimer’s creates a window in which emotional clearing and deep healing can happen. It brings about resolution that unburdens the person and enables them to enjoy a greater sense of peace as they approach the end of their life. Looking forward to the next stage of our journey. We live, we die and then what? Let me out! No, Let me in! … who is the most aware of us all? Alzheimer’s – How aware are we?